Taking inspiration from Iceland: a People's Constitution for Aotearoa? The article below tells the largely untold story of the Icelandic people beginning to throw off the shackles of neo-liberal capitalism. Following the collapse of Iceland's banks in 2008, and the attempt by elites to make the people pay the cost, a struggle for a new constitution emerged. A process facilitated by the use of the Internet to encourage widespread participation and maximise democratic decision making. This is not only inspiring, but points to a possible line of strategic advance for broad left forces in other countries reeling from the global financial crisis. We know that constitutional struggles have played an important role in the revolutionary processes in Latin America, most particularly Bolivia and Venezuela. The time is approaching where it could possible for the broad left in New Zealand to push forward constitutional change that explicitly challenges neo-liberalism and makes steps towards a sustainable, democratic and equitable society. The crises of global capitalism, coupled with catastrophic climate change and peak resources, is going to bring about profound social, ecological and political upheavals. There is evidence of this happening globally already. We can point to the Arab Revolts that have toppled US-backed regimes and the emergence of anti-neoliberal movements of workers and young people in a number of European countries. Part of the context for these revolts is the global financial crisis, which is ongoing and will unravel further, impacting severely on the lives of grassroots people around the world. While the current political situation in New Zealand is a big step away from mass revolt, the forces at work in this country are similar. Masses of ordinary people are hurting, there’s simmering anger towards politicians and other corporate elites, and there’s growing concern at the ecological catastrophe that humanity faces. The political quietism will not last indefinitely. What can eco-socialists do today to prepare our forces for the historic challenges in front of us? Socialist Worker believes the time is right to encourage further cooperation among people who identify as eco-socialists. Across the New Zealand’s existing left parties and socialist groups there are people who broadly share a common political perspective, who want to work towards a sustainable, equitable and democratic future. But equally importantly, there is probably thousands of people not currently belonging to any political party or organisation who broadly share an eco-socialist vision. While it’s very early days, there are some encouraging signs that people are interested in joining an eco-socialist network. 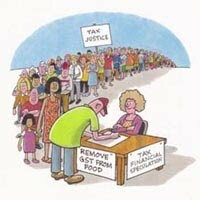 In the near future we want to set up an eco-socialist website/discussion forum on the Internet. We envisage this new site being free of any party branding and that it would evolve, we hope, into a forum jointly run by a number of organisations and individuals. Such a web presence would maximize the sharing of information and ideas relevant to an eco-socialist vision. The site would connect with people through email newsletters and social media. Socialist Worker believes that building a broad eco-socialist network in the short term will be one practical “here-and-now” foundation for a mass-based broad left movement in the future. 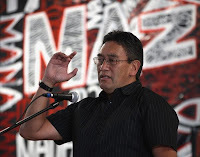 An eco-socialist network would complement other positive developments on the left, particularly the emergence of the Mana Party, which is uniting a flaxroots Maori movement with radical left activists from socialist and union backgrounds. 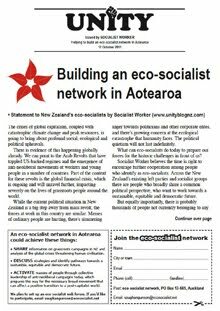 An eco-socialist network would also build on the closer cooperation between leftists that we’ve seen in recent years around campaigns like $15ph Minimum Wage, NZ Not For Sale, Kia Ora Gaza, Tax Justice, and Anti-Mining/Oil Drilling. 2. 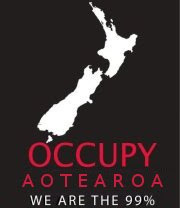 Facilitate open discussion about all aspects of the political struggle in New Zealand and globally. 4. Work towards launching popular strategic campaigns that target neoliberalism and bring activists into contact with broad layers of grassroots people. 5. Encourage a dynamic analysis of the crisis of global capitalism and its impact on material conditions in New Zealand, from which sound political strategies can emerge that provide us with realistic pathways towards a sustainable, equitable and democratic future. While there is a lot to work out in practice Socialist Worker believes a web-based eco-socialist network has considerable potential. We would like to invite interested individuals and organisations to contact us directly about supporting and getting involved in this initiative. Contact Vaughan Gunson, email vaughangunson@ecosocialist.net or ph/txt 021-0415 082. For more on the crisis of global capitalism, which compels the eco-left to join together, read Capitalism's terminal crisis and the global cooperation of eco-socialists by Grant Morgan. On Saturday MANA held its inaugural AGM in Auckland. People came from all round the country, we had a great day and now we’re rolling on to the General Election in November as the free and independent voice for Maori, for workers and for the poor. If the poor voted for MANA we would win half the seats in parliament. We aim to give them the voice they deserve. MANA will represent a newer, more honest, and more principled way of doing politics. We will promote policies that highlight the Treaty as the foundation of our nation, and the basis by which we can provide immediate relief to those in need and long term change that will return the power to ordinary working families. We will not compromise on principle, and neither will we sit politely by while government's sell our nations assets, and price our people into poverty. And we will promote candidates chosen for their unremitting fight for justice, their track record in advocating for Maori issues, and their leadership in the struggle for human rights. The following eyewitness reports from Tash Shifrin, Jonny Jones, Ali Alizadeh, Steve Henshall and Sam Bogg, were published on the British Socialist Worker website. 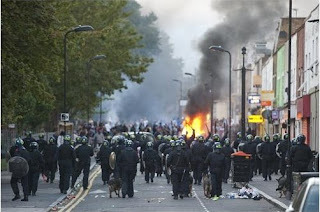 Riots of the poor and dispossessed spread through Britain this week. The police struggled to crush an uprising against their own racist brutality and poverty. The riots reveal the deep-seated social tensions at the heart of Tory Britain. The streets weren’t the police’s any more—they belonged to the angry, disenfranchised and the poor. The activists are being targeted because of their involvement in protests against chocolate shop Max Brenner, a chain store with strong ties to the Israeli military. The protests are part of the worldwide Boycott Divestment and Sanctions campaign, which aims to draw attention to the ongoing genocide committed by the apartheid regime in Israel against Palestinians. The activists were arrested for breaching bail conditions imposed following arrests at a previous pro-Palestine protest at Max Brenner. The bail conditions, which prohibit arrestees going within 50 metres of a Max Brenner shop, are themselves a serious curtailment on the right to protest. The arrestees have been told they will be held until September 5.